We believe business realities and customer experience needs drive IT operational requirements first, infrastructure options second. All IT organizations started as a reaction to early stage business demands. As small companies grew, more budget was allocated in response to new capacity needs. Technical silo's developed around IT functions first, then geographic boundaries. The remnants of this tech-centric culture created many of the challenges our clients face today. Digital change continues to accelerate. The value of technology investments are being eaten away by the lack of time IT organizations have to adopt these changes. Our goal is to simplify change with techniques used by succesful start-ups, resulting in IT "Right Spending" and measurable improvements to the value of IT investments. Most organizations still spend almost two-thirds of their IT investments on non-differentiating capabilities, calling into question the benefits of IT-enabled investments. 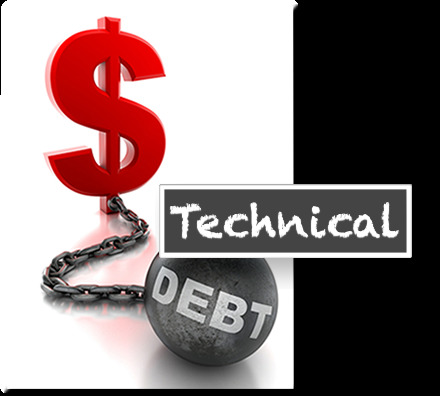 To improve IT's impact on business performance, IT executives must break the dangerous cycle of incurring technical debt, and take a new "Right Investment" approach.